Back into the realm of Polish food, we have one of my favorites: Pierogies. Dudes, when I was in Krakow this year there were literally 24 HOUR PIEROGIE PLACES. Heaven! The idea of a pierogie is simple, you have a basic flour dough wrapper, with potato and onion filling. Sauerkraut or cabbage filling is also completely acceptable. Let’s just call them Polish ravioli’s minus the whole tomato sauce thing. I love pierogies. When I was in college, my dining hall would have vegan pierogies for brunch now and again and I would tupperware billions of them and eat myself into a pierogie coma. My devotion runs deep. Roughly peel and chop the potatoes. Bring a pot of water to boil and boil potatoes until they can easily be pierced with a fork. While they are boiling, saute chopped onion with margarine, be careful not to burn. When potatoes are done, drain the water from the saucepan, add the sauteed onion, with the margarine and all liquid in the pan, to the potatoes. Add the soymilk, salt and pepper and mash. Set aside. To make the cabbage filling, put cabbage in a saucepan with vinegar, salt, pepper and oil. Heat covered on medium heat until translucent. Stir occasionally to be sure it doesn't burn. Fill a small bowl with warm water. To make the pierogies, lay out one dumpling wrapper, add a heaping teaspoon of your filling of choice. Wet your fingers with the warm water and use them to wet the inside edges of the wrapper. It shouldn't be soaking, just a little something to help it stick. Fold the wrapper over to make a half-moon shape and press down with a fork or fingers so it seals. Repeat this until all the wrappers are used up, or until you have enough pierogies. You can refrigerate the fillings to use later, if you'd like. For my pierogies, I mixed the potato and cabbage filling together and just used that, which was maybe kind of weird, but delicious. You can use them separately if you'd like. There are two ways to serve them, but both involve boiling. In a large sauce pan bring water to a rolling boil. Carefully lower about 6 pierogies at a time into the water and boil until they float, about 3 minutes. If desired, you can then fry them quickly in canola oil so they brown on the outside. The ones in the pictures are fried, but I think both ways are delicious. If you do fry them, the whole adding boiled water-covered things to hot oil can be a bit dangerous so wear an apron and be careful. I found it was good to boil 6, lay them on a plate to dry a bit while I do the next 6, and THEN fry. This cuts down somewhat on splattering hot oil all over your kitchen...and yourself. Serve with applesauce and vegan sour cream (as pictured) or eat them plain! shows a mushroom-sauerkraut filling, which sounds delicious. I also saw sweet one’s filled with a sort of sweet cottage cheese in Poland, which I think could easily be translated to sweet cashew cheese with blueberries. OMGzzzz so good. It probably depends on the brand you buy! The ones I use definitely don’t have egg! Usually there’s a more yellow-color one with egg and one without! Of course I live in a city where there’s lots of options, so maybe not everywhere has them. 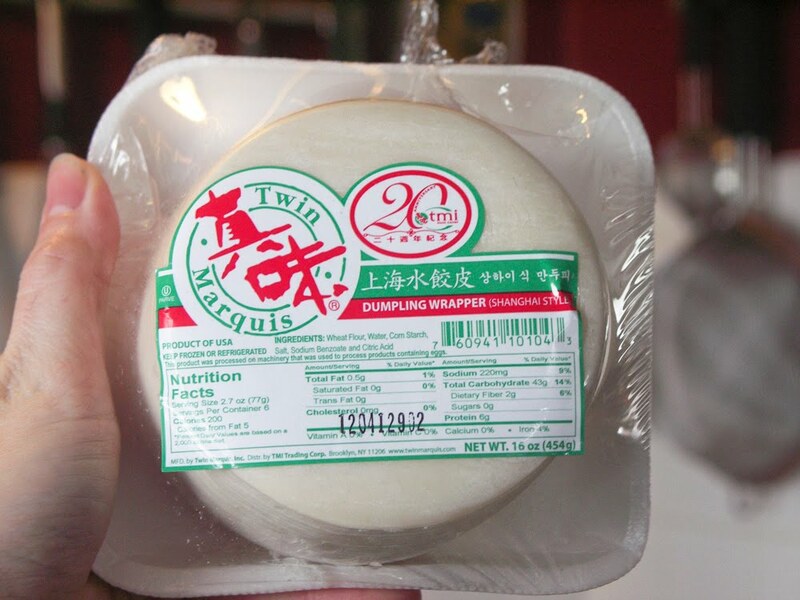 The Twin Vegan brand of dumpling wrappers (actually all of their wrappers) are vegan, It even says so on their website.